Spend a night under the stars, beneath a moonlit sky and a cool breeze gently blowing in your face. Then, a lone voice accompanied by acoustic guitar, singing songs about beauty and madness, power and vulnerability, a range of emotions that are beyond words… Gregory Alan Isakov can just make you forget that you're sitting in a concert venue. He is a unique, stellar performer who offers nothing less than a magical enchanting evening. 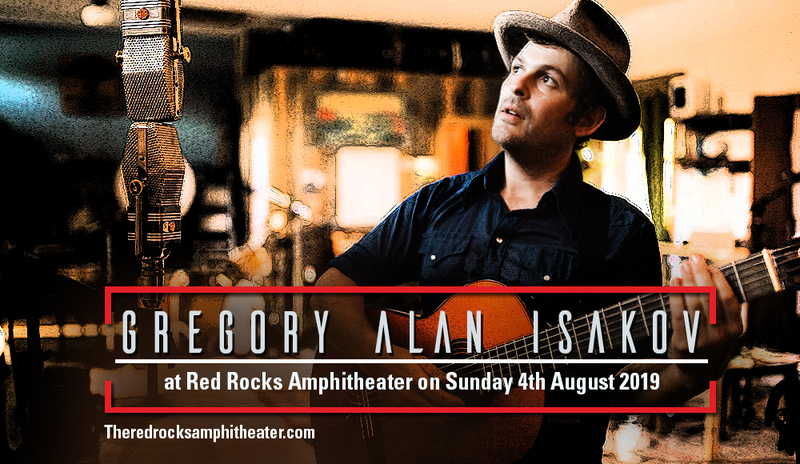 Block-off your Sunday night for the masterful music of Gregory Alan Isakov, happening at the Red Rocks Amphitheater on Sunday 4th August 2019. Tickets now on sale. Click that 'buy tickets' button now! Gregory Alan Isakov is loosely classified as an indie folk artist. Yet his music is beyond style and labels. He has an evocative songwriting spirit the stirs a wave of complex emotions and paints stunning imagery expressed in simple language. He got an early headstart at the age of 16 when he started playing and touring with a band. He went on to pursue a solo career, until he released his 2003 debut album “Rust Colored Stones” Two years later, he followed it with “Songs for October”, then with 2007's "That Sea, the Gambler." Isakov is a regular at various music festivals in America and across Europe. He has played on the Rocky Mountain Folk Festival, the Falcon Ridge Folk Fest and the South Park Music Festival. Critical recognition poured in with his 2009 album The Empty Northern Hemisphere and its single "If I Go, I'm Goin," which was also featured on an episode of the Showtime series 'Californication'. His music also went on to be featured on television soundtracks such as “Ride the Devine”, “Where the Yellowstone Goes”, and the wildly successful TV program “Veronica Mars”.